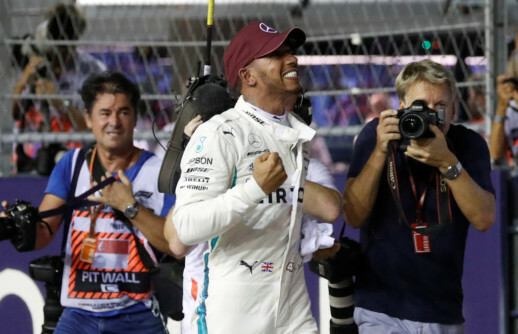 Singapore: Mercedes driver Lewis Hamilton took a brilliant pole position for the Singapore Grand Prix ahead of Red Bull’s Max Verstappen under floodlights on Saturday. Hamilton produced something special to set a blistering time and secure a record-extending 79th pole position in Formula One and 200th for a British driver. With title rival Sebastian Vettel qualifying only third, it was a great night for Hamilton and he surprised even himself by how quick he was. Ferrari looked strong in practice on the sinewy 5-kilometer (3.1-mile) Marina Bay track. But when it counted, Ferrari could not find the pace and Vettel’s teammate Kimi Raikkonen was fifth behind the Mercedes of Valtteri Bottas. Earlier Saturday evening, Vettel was fastest in the third and final practice ahead of Raikkonen, and Ferrari did not see this setback coming. Last year, Vettel started from pole here and was perfectly poised to reclaim the championship lead from Hamilton. However, he crashed heading into the first turn, taking out Verstappen, Raikkonen and Fernando Alonso with him. Vettel is under pressure as the title appears to be slipping away from him. Both Vettel and Hamilton are bidding to join Argentine Juan Manuel Fangio on five F1 titles and move level second all-time behind F1 great Michael Schumacher on seven. Vettel is 30 points behind Hamilton and racing on a track where seven of the past 10 races have been won from pole. After Singapore, there will only be six races left, and the German driver cannot afford to fall further behind Hamilton in Sunday night’s race.